Currently, NATO lacks a common understanding or consistent use of the term ‘NATO Space Operations’. Today, discussions about NATO Space Operations are commonly reduced to purely focusing on the Space segment (e.g. Command and Control (C2) of satellites), and often neglect the ground, user and link segments. This may be largely due to a lack of know­ledge or due to political sensitivities associated with the topic. Whatever the reason, it is dangerous to approach this subject with a narrow focus. To illustrate the danger of this lack of a holistic understanding, consider the analogy of the ‘iceberg phenomenon’, where ­approximately ten per cent of the iceberg’s volume is visible above the waterline. Consequently, we have no, or only limited know­ledge of, what is beneath the waterline. We can apply this analogy to the complex system of Space Operations: the tip represents the current narrow focus on the Space segment, and the looming danger beneath the waterline represents the current lack of a unified, collective understanding of the other assets of NATO Space Operations and the potential threats to them. Today, Space products and services are seamlessly integrated into NATO military operations and indeed have changed its thinking and behaviour. No commander likes the idea of leading an operation without satellite communi­cations, satellite pictures, weather forecasts, GPS for position, navi­gation and timing, or the ability to operate MALE / HALE UAVs. However, this is exactly what may happen if members across NATO do not have a common understanding or approach to all the elements which comprise Space Operations; this is the NATO Space ‘Operations Iceberg’. Although NATO no longer owns satellites and does not exercise C2 of any satellite, NATO’s Alliance Ground Surveillance (AGS) and the International Security Assistant Force (ISAF) demon­strate how Space capabilities support NATO combat operations. This is made possible through Space products and services provided by NATO member countries. Additionally, NATO contracts commercial satellite communication services to satisfy its ever-growing communication needs and still possesses Space assets (e.g. static and mobile ground ­satellite communication stations). This use of Space capabilities has led to critical dependencies and added new threats to NATO oper­ations. The ‘NATO Space Operations Assessment’ (SOA, 2009) and the Schriever Wargame 2012 International (SW12I) have identified / addressed some of NATO’s shortfalls. NATO acknow­ledged its dependency on space and tasked several entities to investigate. Amongst others, a Bi-Strategic Working Group was established and tasked by mandate ­to investigate some of the operational dependencies and educational questions. ISAF, NATO SOA and SW12I are milestones in NATO’s efforts with respect to Space and reflect one common element: NATO conducts Space Operations and those operations are intrin­sically linked with NATO operations. Although NATO’s Allied Joint Publication AJP-3.3(A) – Allied Joint Doctrine for Air and Space Operations addresses Joint Military Space Operations, the Alliance lacks a common, holistic understanding of what activities are included across the full spectrum of Space Operations. A sole focus on the Space segment and its C2 functions ­neglects three of the four elements of Space Operations. The fact that NATO does not own Space segments must not lead to the wrong conclusion that NATO does not conduct Space Operations. It is imperative to acknowledge that the iceberg tip carries a danger looming beneath the waterline. In order to clarify this misconception, all NATO nations and NATO entities must develop a common understanding of Space Operations to avoid underestimating the threats. NATO will not operate across the full spectrum of Space ­Mission Areas described in AJP 3.3 (A) (e.g. Space Support or Offensive Space Operations). But it is of utmost importance to understand the interdependencies across the full spectrum of Mission Areas and the implications to NATO Joint ­Operations. By adopting AJP-3.3(A), NATO member countries already agreed on a common understanding of Joint Military Space Operations. Accepting the fact that NATO does conduct Space Operations and understanding the complex systems behind the conduct of Space Operations is consistent with forming a holistic approach. This will also highlight that Space Operations and NATO operations are intrinsically linked and will allow the maximum exploitation of Space in support of NATO operations. Today Space is a congested, contested and competitive domain4 and NATO is heavily dependent on Space capabilities more than ever. • Although NATO does not own nor exercises C2 over the Space segments it receives, NATO conducts Space Oper­ations in the context of the adopted AJP-3.3(A). 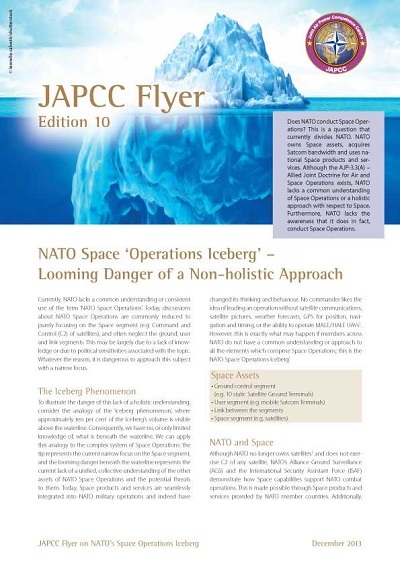 • NATO must acknowledge, accept, and fully understand what the entire nature, implications and threats to Space Oper­ations are, as agreed upon in AJP-3.3(A). • NATO has to define a common holistic approach and to ­develop policies, strategies and guidelines to improve the common understanding of Space Operations. Neglecting the fact that NATO conducts Space Operations leads to an inadequate perception of Space capabilities and fosters a ‘stove-pipe’ mentality. This could lead to incorrect threat assessments, limited decision options and bad decision making. Following the analogy, this is equivalent to assuming that there is no ice underneath the waterline of an iceberg, which can ultimately prove to be catastrophic. 1. MALE-Medium Altitude Long Endurance, HALE – High Altitude Long Endurance, UAV – Unmanned Aerial Vehicle. 2. During the Cold War, until the year 2010, NATO owned several communication satellites. The last satellite, NATO IV, stopped operational service in 2010. TT&C was handled by the USA and the GBR. 4. HQ SACT Report on SW12I, p. iv.